As a working mom of two, I was always running late due to little last minute potty breaks and missing shoes. Once baby number three was in the talks, I decided that it was time to get organized and stop parenting from going all “pear shaped.” I didn’t want the stress of balancing a career and raising children to take the joy out of it. In my mission to get organized, I created a little trick to keep my kids shoes snapped together. This kept my kids more organized and me less stressed! After using the little shoe snaps for a year at home, I received a scholarship from google for a 16 week class at the Nashville Entrepreneur Center to launch them as a business. Only 5 weeks into the process we formed the LLC, have a beautiful website and are now selling in four boutiques as well as on Amazon. All of this is taking place while very pregnant with baby #3…and I’m feeling completely balanced! How many times are you running out the door to get the kids to school, a doctor appointment, friends house or meeting and you find yourself searching and digging for your child’s missing shoe. 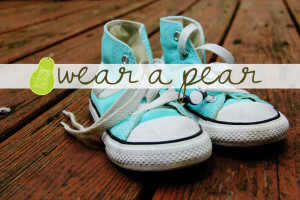 We have developed a fun and easy way to keep shoes paired with “Wear a Pear.” Shoes stay snapped together for storage, hanging over a handle of a duffle bag, or packed for travel. Since shoes are always together, they are easy to find, transport and keep organized. Not only does this reduce stress, but it teaches children responsibility when kids 3-4 yrs old can snap and unsnap their own shoes! In addition, they are designed with one white snap and one brightly colored snap to teach kids left from right when parents always place the “white snap on the right!” Every time a child looks down, they see that the white snap is on the right foot. Project Eve has been helpful by providing insight, encouragement, resources and opportunity for us to grow as a female owned company. Small retailers are a great place to start shopping your new product but the slow turn-around and re-orders are not enough to sustain a small business so pursuing online marketing solutions for direct sales and large orders can take your product to that next level of exposure. Previous articleHow Do You Deal With Business Setbacks? I am a mom of 2, and a partner in a small business and I LOVE this idea. Are these babies available in Canada currently? Also, if you need any help with any of the “dirty details” of business, that happens to be what we specialize in! Heading to check out your website. Good luck with the rest of pregnancy #3!